Find and book your car hire at Noosa Heads with VroomVroomVroom. We offer the best deals of car rental brands by some of the country's major suppliers. These include Avis, Budget, Hertz and Thrifty. Located on the Sunshine Coast, Noosa Heads is a popular touristy town. Famous for its beaches and Hastings Street, this area has so much to offer to both domestic and international visitors. Noosa Heads National park is home to the adorable Koala. Get ready and have a taste of the remarkable scenery of the area. You can expect to see sophisticated eateries, European style cafes and some very cute locals. Why rent a car in Noosa Heads at VroomVroomVroom? To fully experience the best, make sure to book a car rental with us so you can enjoy the freedom of exploring the city at your own pace. Here are other top reasons why customers choose to book their hire cars with us. Use our easy booking system. Fill in the search menu with your itinerary plans and a comparison list of available car hire along with their rates will be generated for your reference. We suggest that you book your car reservation in advance to avail cheaper rates. Change of plans that may lead to cancel your reservation won't be a problem. Cancel anytime and pay nothing. There are also no booking fees and other hidden fees so you are sure to pay the exact amount. We guarantee the lowest rates. If you get a cheaper deal from other websites, contact us and we will refund the excess and even give you $20! Checkout our Price Promise page to learn more. We also have several pick up locations in and near for your convenience. Contact us for assistance and we will be happy to answer all of your queries. Our friendly customer care experts are ready to help so feel free to call, email or chat with us. The Noosa Main Beach is the premier beach in the area. The waves here are rarely over one meter high, and the flat sandy bottom is ideal for beginners to the world of surfing. These conditions are possible because the beach faces north - one of the few beaches in Queensland that does so. This makes the waves smaller, the sand flatter, and a safe place for swimming all year round. Noosa Main Beach is also a good fishing location. If you continue around the headland, you will come across the beautiful Alexandria Bay. This is a clothes optional beach and is one of the nicer sandy beaches and it doesn't get as busy as Main Beach in peak season. Only 7–10 min drive from the southern edge of the Noosa Heads is Sunshine Beach. Across the road and set on a hill overlooking the ocean is the Sunshine Beach Surf Club. From the beach, whales and dolphins can often be spotted frolicking in the ocean. Sunshine Beach also offers access to the southern side Noosa National Park and its secluded Alexandria Bay. The area of Noosa Heads has stunning scenery, excellent climate, high standard shops and restaurants, fun activities, hospitable accommodation and carries a charm that can bewitch people in this destination. Abundant hinterland and golden beaches surround Noosa. The nearby bays and coves compliment the eye-catching background. There are three main beaches where you will surely enjoy when you include them in your stops in your road trip. Noosa Main Beach, Alexandria Beach and Sunshine Beach are the suitable places for swimming and basking under the sun. As the Sunshine Coast is not as densely developed as the Gold Coast, Noosa Heads is truly a remarkable destination to enjoy all year round! If you really want to get out & about and see all that the city has to offer, then we recommend getting a car hire. Check out our guide below to help you decide where to go, stay, and dine on your next visit. The vision of the late Steve Irwin ("The Crocodile Hunter") and his widow Terri is to make Australia Zoo the largest and best wildlife conservatory in the world. Together with a team of conservationists, they work 24/7 to maintain the zoo and provide the best animal experience to its visitors. This place allows you to get up close with wild animals including the tigers, koalas, red pandas, and wombats. Who wouldn't fall in love with these animals? 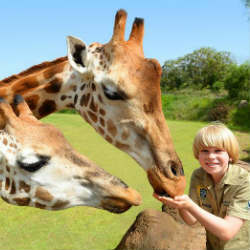 Kids can even become a zoo keeper for one day and discover what happens behind the scenes of Australia Zoo. For more information, please visit their official website. Triple Olympian Alex Watson owns and manages Equathon, which offers horse riding tours on the Sunshine Coast. Enjoy riding a horse along the pristine beach of the Noosa North Shore and on the Noosa Trail Network. They offer different kinds of horses (including Australian Stock Horses) to suit each person's riding skills. Equathon offers overnight tours, which include accommodation and food for a complete horseback riding adventure. They also have a 7-day/6-night option for both Beach and Bush horse riding tours. They've gained numerous recognition for their service including the “Adventure Tourism Operator of 2011” award for Queensland! Sunshine Coast's popular family attraction provides various activities for both kids and adults. Top Shots Fun Park boasts of its two different 18-hole mini golf courses, Indoor Rock Climbing Wall, and Extreme Vertical Trampoline. If you're ready to get wet and wild, make sure to try the Cannonball Blaster, Blaster Boats, and Inflatable Waterslide. The fun park also features arcade games and there is also a fast food café where you can enjoy some delectable snacks. If you're searching for the ultimate shopping experience, then make sure to check out Noosa Civic Shopping. Sunshine Coast's premiere shopping destination is situated near Hastings Street and just a few minutes away from the M1. The centre features Woolworths and Big W, as well as 100 specialty stores that offer both local and national brands. This place also has a medical centre and fitness centre for those who want to get a quick check-up or work out while at the shopping centre. A place that still includes water but this time with green scenery is the Kinaba Track. If you want to relax for a while, get off the wheel and enjoy the Kinaba Track. Kinaba Track is located at the upper part of the Noosa River. You will definitely enjoy watching the cool surroundings as it blends with the waters. Tannins washed from decaying plant matter stain the waters a very dark color, almost black in deeper sections, which shows spectacular reflections of the twisted paperbarks and blood woods that line the waterways' banks. The Kinaba Track will also take you through forests, paperbark swamps and cabbage palm wetlands. You will see the vegetation varying from open forest to areas dominated by melaleucas and swamp banksias. The Noosa Head Coastal Track is located in Noosa National Park. Here, you can see spectacular views from several lookouts along the coastal track. Along the track, you can also see coastal rock formations and many beautiful beaches including the Tea Tree Bay, the Granite Bay, the historic Winch Cove and the sweeping Alexandria Bay. Opposite the beaches, you can see cute koalas hugging the gum trees along the track and honeyeaters that are often seen in the flowering shrubs next to the track. The resort is conveniently located near Hastings Street and Gympie Terrace's “Eat Street”, so there will never be a shortage of dining and shopping venues. The beach and the major retail strip is around 20 minutes away by foot, but you can always hop in your car rental if you aren't in the mood to walk. RACV Noosa Resort features stylish suites, spacious apartments, and beautiful villas. Take advantage of the other facilities offered by the resort, including a day spa, tennis court, and fitness centre. Kids will surely have fun at the playground, splash park and water slides. For more options in accommodation, check out the deals offered by our friends from Wotif. After swimming or sunbathing, the perfect place to cool off is at Nitrogenie, which is located across the beach. This isn't your typical ice cream shop because they use the liquid nitrogen when making their incredible creations. Does it sound like a science project? Don't worry because they use real food ingredients such as creamy milk and eggs when making ice cream. 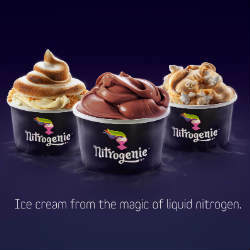 Their flavours are always changing, so you are sure to taste something new each time you visit Nitrogenie! This restaurant has been greeting early risers with delectable breakfast meals and night owls with late night snacks since 1986. They work around the clock to provide affordable and flavourful food to both new visitors and to their loyal return customers. Café Le Monde features local products including Clandestino Roasters coffee, Noosa Cleanse cold pressed juice, and Tanglewood Organic Sourdough Bakery breads. You can also catch local bands and DJs perform at the Café Le Monde from Thursday to Sunday. Feedback: Hassle free thanks . Avis Noosa Ocean Breeze Resort - Corner Hastings Street & Noosa Drive, Noosa Heads, QLD. Budget Noosa - 52 Mary Street, Noosaville Qld, QLD. Hertz Noosa Heads Downtown - 16 Noosa Drive, Noosa Heads, QLD. Thrifty Noosa Junction - 49 David Low Way (Cnr Honeysuckle Lane), Noosa Heads, QLD.